Right in the centre of Brighton’s seafront, in Sussex, is what is now known as the Sea Life Centre. 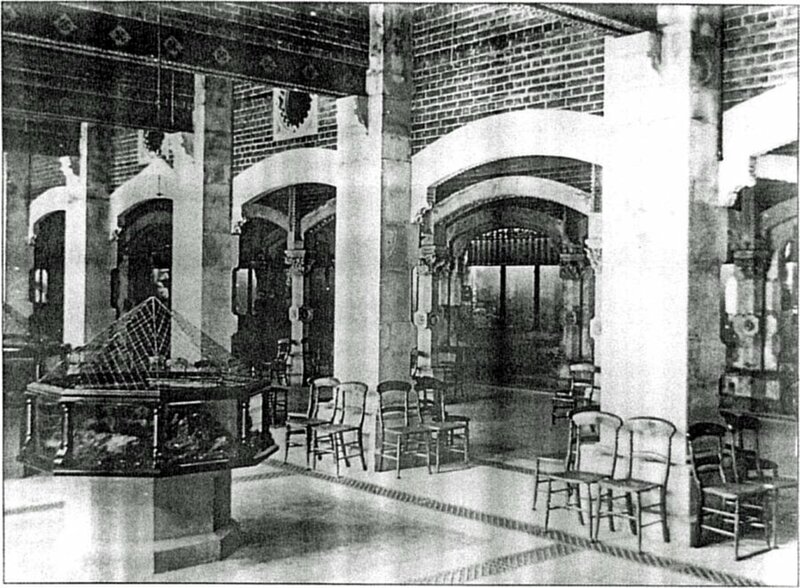 It started life as ‘The Aquarium’, and was officially opened to the public by H.R.H. Prince Arthur in 1872, and has drawn more than fifty million visitors from both England and abroad throughout its long and varied history. It was built on a vast scale, and housed the largest display tank in the world, containing nearly 500,000 litres of seawater. 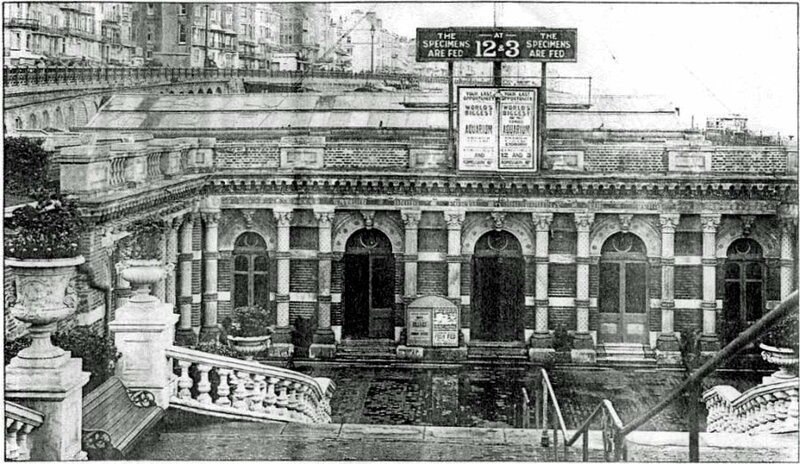 It included a large octopus among its attractions, and, at the eastern end of the building, the Winter Garden flourished as a centre for concerts and recitals. They were also responsible for the external ornamentation, such as vases and balustrading, as can be seen from Fig 1, although the only picture I could find of the tanks themselves is shown in Fig 2. The main tanks can just be seen in the background here. 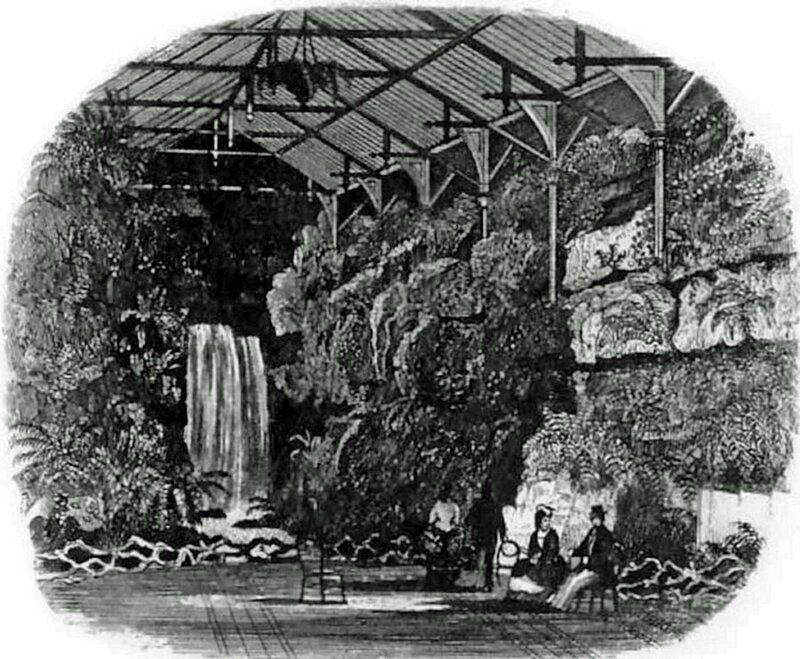 The waterfall is shown in full flow in the artist’s impression of the conservatory, shown in Fig 3, while Fig 4 shows the Pulhamite rockwork on one side of the Fernery. ‘We have drawn attention to the Aquarium at the Crystal Palace. It is entirely the work of Mr.Lloyd. He keeps his guests in good health, ministers to their comforts, and is continually receiving new acquisitions to his admirably arranged tanks; (but) he has not sufficient knowledge or experience to give the tanks the picturesque character they are made to assume at Brighton. Indeed, it is probable that financial considerations influenced him in their construction – the cost of the one exceeding £7,000, while, probably, that of the other was not much over £10,000. But the Aquarium at Brighton has advantages that Crystal Palace never can have. They are obvious. The tanks are prodigious in size – two of them, indeed, are in length 60ft. and 120ft. ‘It is, however, less with the Science than the Art of the Brighton Aquarium that we have to do. It is a pleasure to know that its Art is of a right good order. As it is, the best has been done that could have been done. Descending several stairs, lined with graceful Terracotta vases, examples of Art-manufacture, the works of Mr. Pulham – with most of which engravings have made our readers familiar – we enter the vestibule. 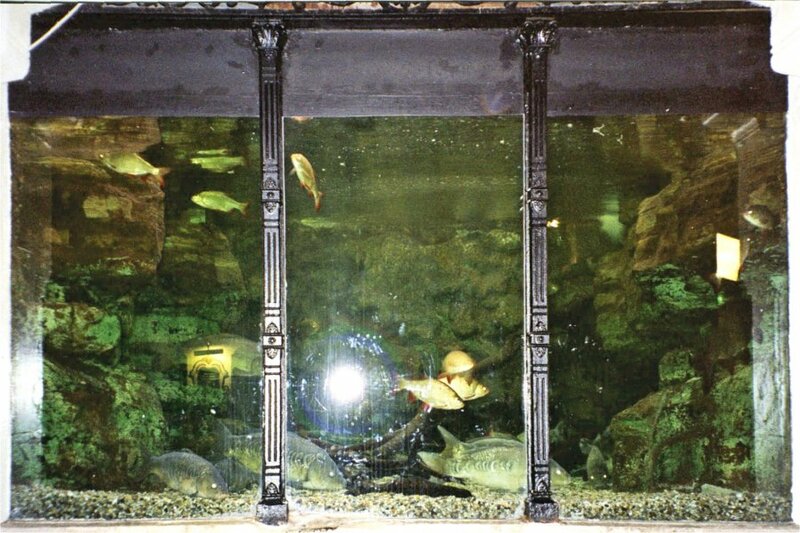 Each tank, entirely open – or, rather, enclosed by huge sheets of plate glass – is lined at the back and at the sides by picturesque rockwork, judiciously and very tastefully constructed, with wisely-arranged interstices for the fish, wherein, perhaps, they hide too much, but which give them shade and consequent health. Fish, like all other created things, must have retirement and rest. ‘In time, the rocks will be partially covered with conferva, and the actiniae will soon cling to them as homes – they have partially done so already. The rockwork, as well as the other work we shall presently describe, is entirely the design and construction of Mr, James Pulham, of Broxbourne. They advance indubitable claims to rank as examples of Picturesque Art. At the end of the broad passage, on either side of which are the enormous tanks, is one of the most impressive, most effective, and most refreshing sights to be seen anywhere – rock-cliffs, ferneries and waterfalls: that is also the work of Mr. Pulham. ‘It is to this particular feature of the Aquarium that we desire to direct the special attention of our readers – not only because it adds very greatly to the attractions of the place, but as a mode for all other undertakings of the kind wherever executed. As evidence of what may be done in the way of grace and picturesque beauty in private grounds – small as well as large – and in extensive or moderately sized conservatories and ferneries, Mr. Pulham is well known. We have, from time to time, engraved many of his productions – in Terracotta vases, principally, and fountains – but, for some years back, he has also devoted himself to works such as that we are describing – often on a far more important scale, as in the grounds of Mr. Bessemer, at Denmark Hill, and notably in the park at Battersea, on which time has had its improving influence. ‘His supremacy above other ‘decorators’ of this order he owes chiefly to his extraordinary imitations of sandstone, which, we believe, is a coating of cement and sand, mixed by some peculiar process, and laid over common stones, burrs, flints, etc. The mixture, be it what it may, is so pure as not in the slightest degree to prejudice the water that passes over it, or to injure the plants that grow among and about it; while its appearance is so natural as easily to deceive the uninitiated, and, indeed, the eye of the geologist. ‘We were told that the men of science who assembled at Brighton in the summer expressed surprise where he could have obtained blocks so large, and they were not undeceived until after a careful examination. It is made to assume the various textures and colours of the actual sandstone – the colours being in the substance, and not merely laid or painted on. Obviously, these blocks may have the most picturesque forms; vacuums may be left ad libitum; hollows to hold soil for ferns and other rock-growths. Here one may be rounded, and here one pointed; a mass may be in this place, and a bold projection in another; interstices for planting being judicially left wherever they can be most effective; while water may be made to fall from the summit, winding about fantastically, yet naturally rushing over caves or dripping through mosses, terminating in rugged pools where fish harbour, and running in narrow rivulets, or through broad channels in which flourish the flower-weeds of the lake and river. ‘This is what has been done at Brighton . . . at the Aquarium, seats are placed at the east end, just outside the music-room, whence the whole effect of this fernery is seen at a glance. The water falls over a massive rocky brow – as shown in the engraving – winds about, forms pools, and runs off through small channels. The several interstices are even now richly planted with ferns – young as yet, but giving abundant ‘greenery,’ and destined to grow so that they will clothe the whole with verdure, and require trimming rather than nursing. An internet search enabled me to locate a picture of the front cover to the Official Guide to the Aquarium, but this was housed in the Smithsonian Institute of Washington, so it was not possible to study it in detail. An enquiry revealed that its general condition would not permit the photocopying of all pages, but the Curator was kind enough to e-mail me a copy of one of them. 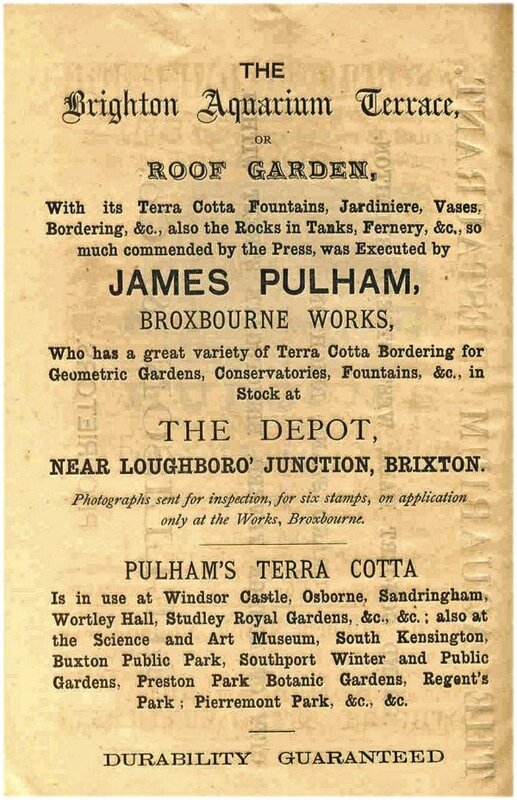 This was of an advert page on which Pulhams told the world about their Terracotta, and it is reproduced here as Fig 5. 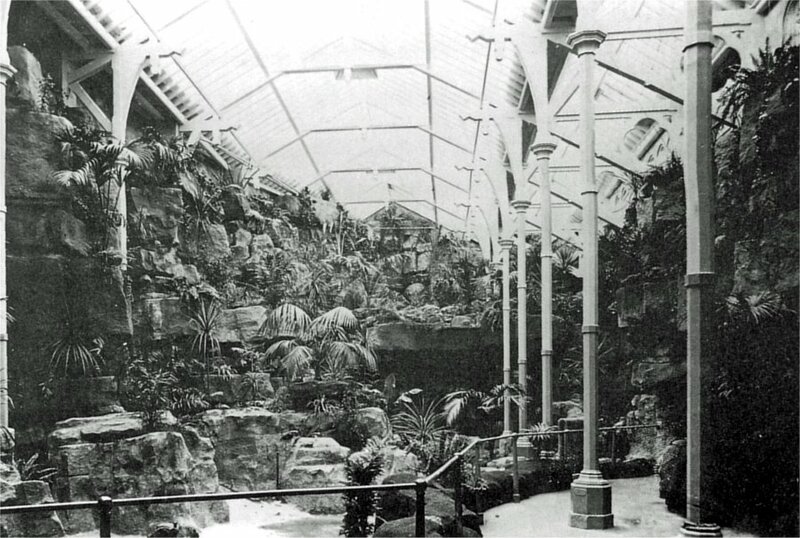 Sadly, it is not possible to enjoy today the full magnificence of the Aquarium’s original glory, because the fernery was replaced by a Winter Garden early in the 1900s. In actual fact, the whole site had a very chequered history, including being taken over by the Government during the First World War. After several years of subsidised opening during the early 1920s, improvements were planned in 1927, and, in 1929, the Winter Garden was replaced by a ballroom. The Aquarium was leased to a private company in 1939, but was taken over again by the Government during the Second World War, during which period it suffered from what one might call ‘inevitable neglect.’ After the war, it was decided to house animals there, as well as fish, and the chimpanzees’ afternoon tea parties soon became a very popular attraction. In 1967, a dolphin pool was added, and this was so successful that it was decided to reconstruct the ballroom – which, by that time, had become a vintage car museum – as a Dolphinarium. This attracted nearly 400,000 visitors every year, and later additions to the attractions have included more souvenir shops, a trout stream, a new sealion pool, and a new pool for Harbour Seals. It was re-christened as the Brighton Sea Life Centre, and is now regarded as an important education centre. Sadly, the first victim of all these changes and developments was James 2’s large fernery that had once been the focus of so much admiration, and my initial impression was that none of his work now remained here. But this is not the case, as I discovered when I first spoke to Toby Forer, General Manager of the Sea Life Centre. He became very interested in my investigations, and wondered whether the display tanks in the front area of the Aquarium may still contain the original rockwork. There are not as many now as there used to be, but, as far as he was aware, these tanks were still the original ones that were installed in 1872. He was right! A few repairs have had to be made in one or two of the tanks, and some of them have been reduced in size over the years, but there is no doubt about it – the Pulhamite is still there for all to see, as can be seen from Fig 6. This was a very exciting discovery for me, because this is such a unique example of the application of Pulham’s skills. These tanks are among the original ones that can be seen in the background of the old photographs reproduced in Fig 2. Fig 6 shows one that has probably never been changed, because one can still see the rockwork along the back wall, as well as on both sides. There are some more tanks here that are in need of some restoration, and are currently not being used for displays, but it is hoped that it may be possible to attract some Heritage Lottery funding to enable the appropriate restoration to be made. This would certainly be great news for all Pulham enthusiasts. . .
Posted on March 29, 2014 June 4, 2016 by Claude HitchingPosted in Sites Month 2Tagged . . James Pulham and Son, Brighton Aquarium, Brighton Sea Life Centre, fernery, Winter Garden.